Grab a brush and turn fantasy into reality! This incredible painting kit creates a fearsome dragon, a noble griffin and a terrifying three-headed dog! You’ve read all about these beasts in history’s greatest stories. Now pick up a brush and turn them loose! 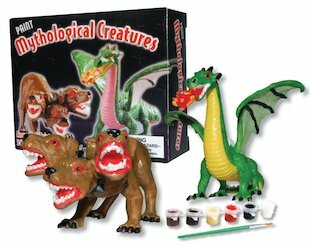 Kit contains three animal figures, six acrylic paints, a paintbrush and glaze.